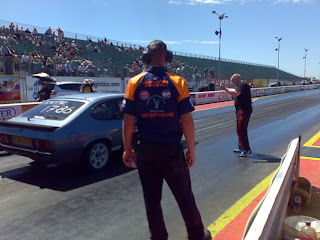 We made it to the finals despite all the problems so we get to come home with a trophy. Unforunately the car couldn't manage the steps to the podium so he had to pose in front of it. Tet lost out in the final to Kevin and the Toyota Soarer but I think we can let him off, it was good tight race. Just time to tidy up, stow everything and get stuck on the motorway. Firstly, if the images are rotated I'm sorry I'll fix them when I am back at my home computer. Last night our final qualifying round was postponed, which for Sportsman ET usually means cancelled, but we were called this morning and two ford lead the queue to the start line. It was great to see the two of them out together. We've been having pretty slow runs this weekend and no obvious reason so despite my hip causing problems I was determined to be on the start line today, and it seems to have helped. 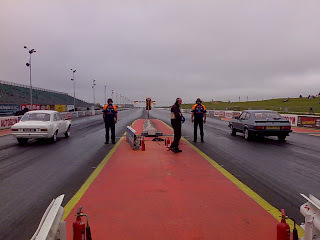 We have just got through the first round of eliminations and the car seems to be running better. 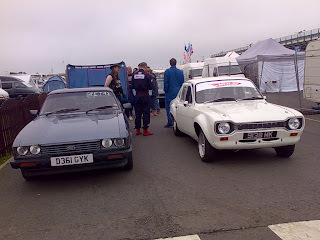 I had been going to end with this one, but blogger is somewhat like kicking a dead whale along a beach today and I would rather be at the race track so I will live with the pictures in whatever order blogger feels like. This is Greek Fossils with it's awards. 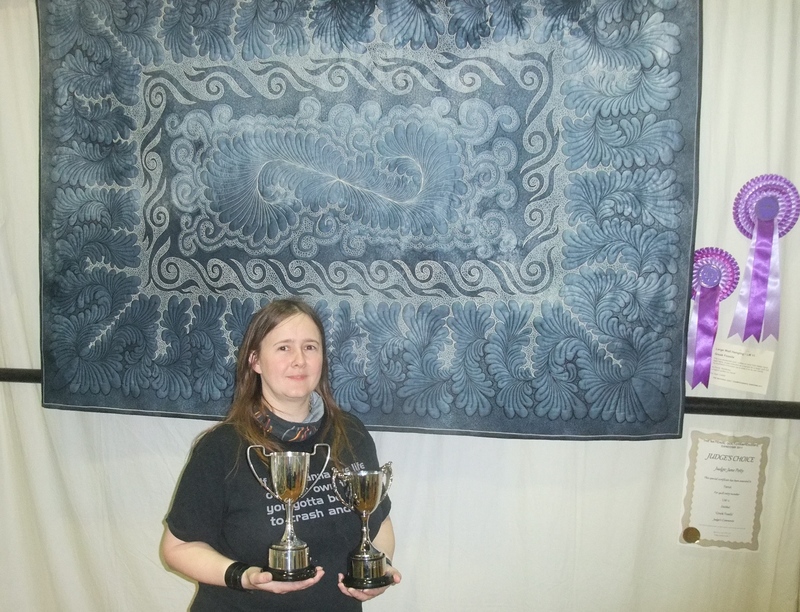 It took first in large wall hanging and the Fran Jones longarming award. It's the first time I've managed to win this since Fran died, so I am thrilled to have it again. I think Mandy Parks will forgive me for breaking her winning streak. This is "The Pleasure Domes of Xanadu". It belongs to one of my students from Thursday night, Jane. It is a quilt she had made to use up leftovers from another quilt, and I only happened to see it when she had a mass quilting of tops. I was lucky enough to quilt several tops for her but this one I felt was a bit special. It was also a bit of a pain in the backside. 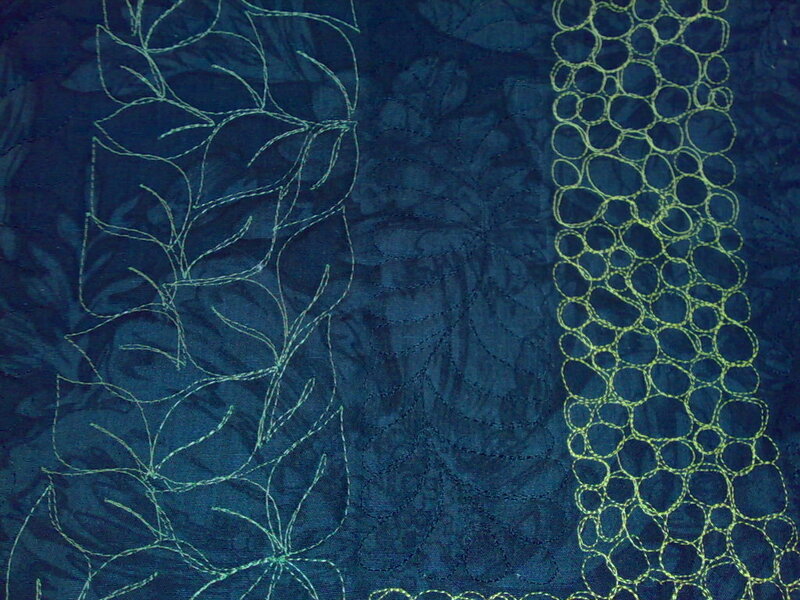 I have no idea how Linzi Upton copes with using so much of this wriggly gold fabric. 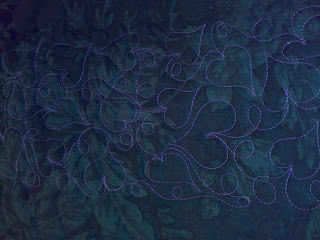 It's a nightmare and the only way to control it in the quilt was to stitch in the ditch on both sides. If you know me, you know that is just not something I do but well if the quilt demands it who am I to argue. 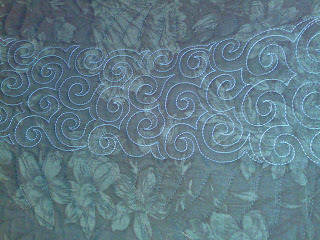 The quilt has very clever use of fabric and was a joy to quilt. I am thrilled she agreed to share it with everyone at the show. Next we have "100 Proof". This is the quilt Tet made to test my books instructions. It's not only his first bed quilt, but his first quilt in general. Not bad after not using a sewing machine for a quarter of a century. 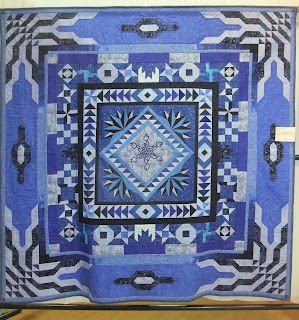 I thought it would be good to have a clear picture up of this as I think it is the most requested modification of my quilt. Tet thought the half square triangles would be quicker for the outer border than the celtic knots I suggested. He was probably wrong, but the outer border is really striking and hopefully those who want to copy it will not be able to work it out. 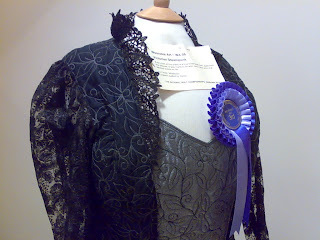 Lastly (by bloggers choice remember) is "Vanessa's Rhapsody". I don't think the photo really does justice to this and I might have to have a chat with Vanessa about getting a picture of the back. 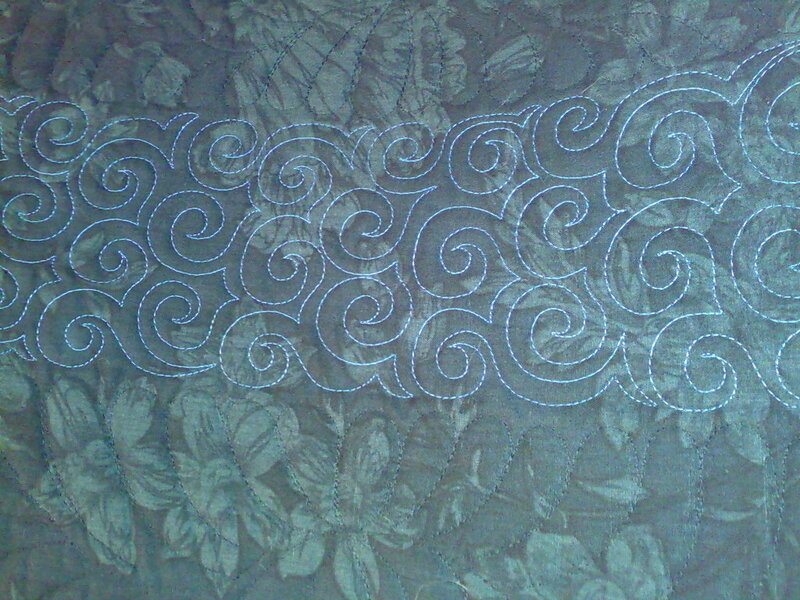 The thing that makes this quilt for me is the quilting, which isn't showing as well as I would like. This was a real step out of her comfort zone, and at times quite a fight. We both learned a lot from this quilt. 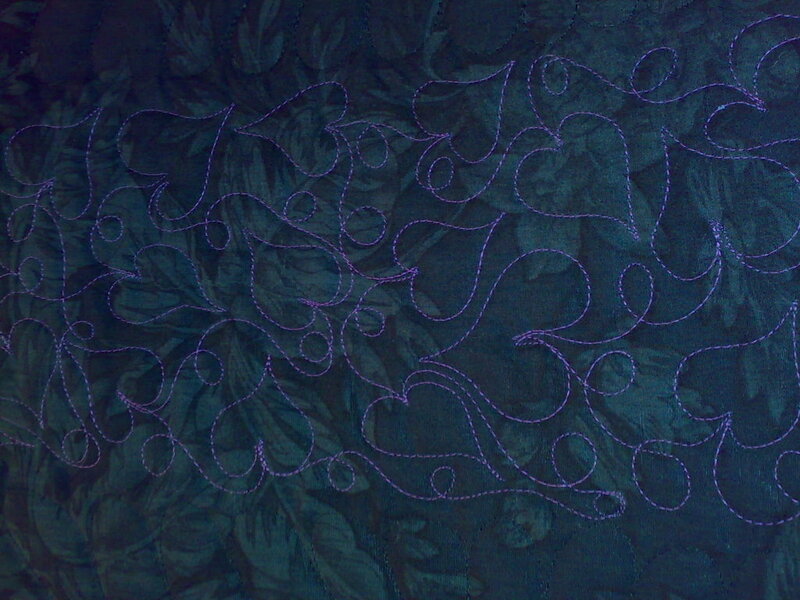 Never ever try to put bits of a rhapsody quilt together when you are already having bad day. 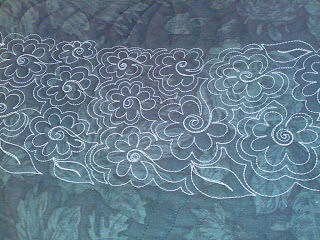 Sewing the curves is fine when relaxed, when you aren't it's really hard. 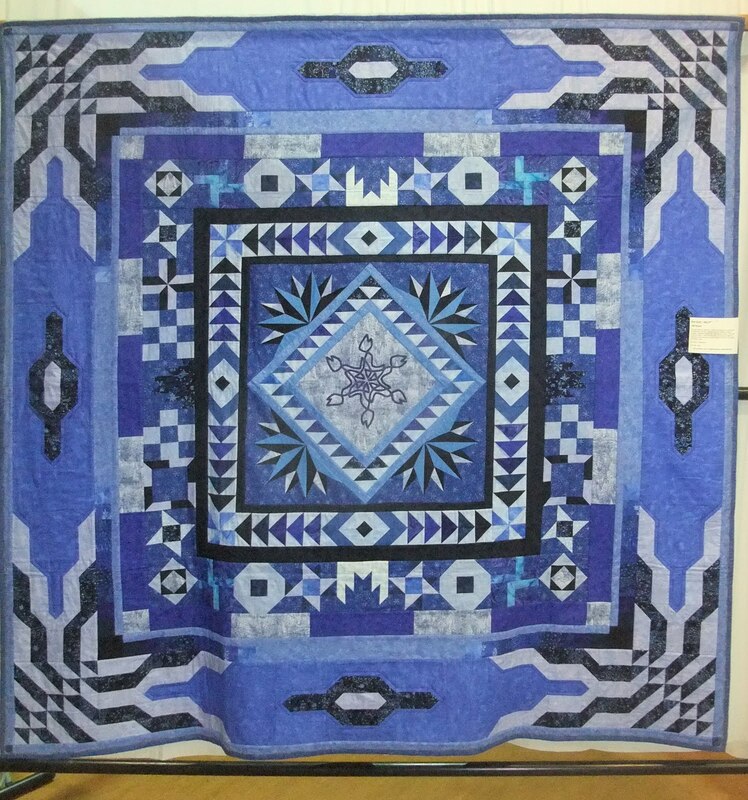 Vanessa also wasn't sure about machine quilting when she started but has finished the quilt off with freehand feathers in the four background corners. This is a very special quilt it seems to have inspired not only Vanessa but other members of the group and it was great to see it in a show, if not as visible and well lit as I would have liked. I'm trying very hard to encourage more of my students to enter next year. We had a great day on Sunday and I would love to share that feeling with more people. 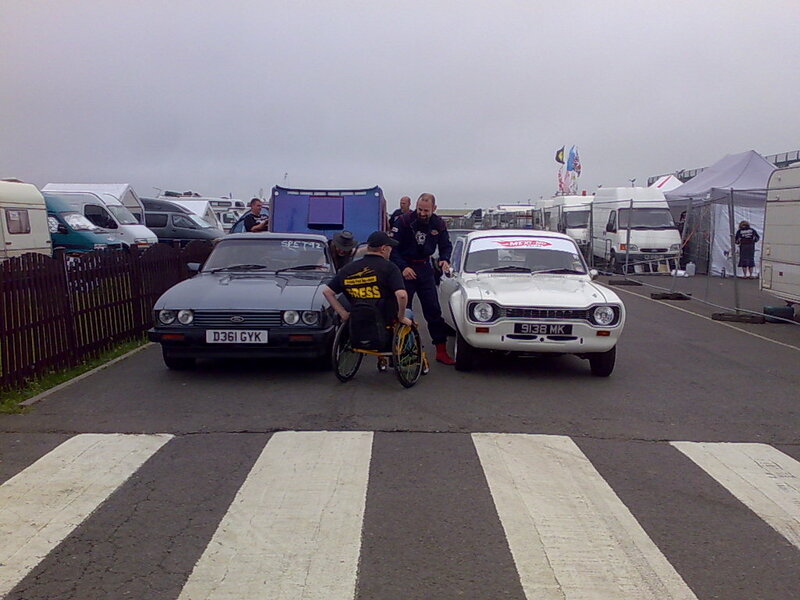 Maybe next year you could have a go? There is a special extra category at Sandown next year. "In the pink" all the entry fees from that category will go to Breast Cancer Care. What more excuse do you need to have a go. You can support charity, get a ticket to the show and get the thrill of seeing your work hung all in one go. The entry forms are available from here. 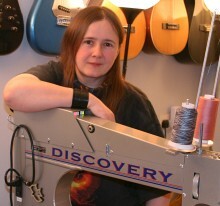 The one you need for "In the pink" is "National Quilt Championships 2012". See you at Sandown next year. I can't remember the last time I managed to log on to blogger, but I've done it now. I guess I had better go and reply to your comments. I hadn't been ignoring you but it was even refusing to let me use them without a login. I hope it's actually fixed. 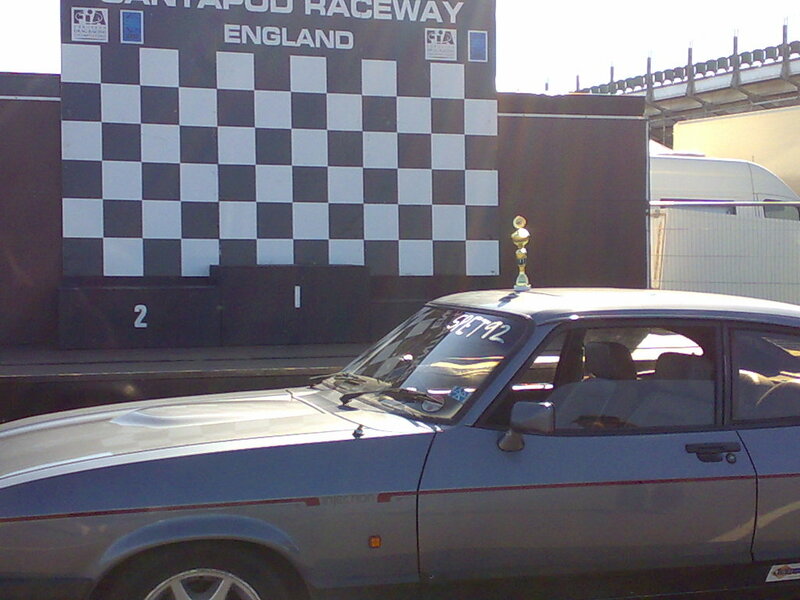 Sandown was fun at the weekend. The highlight for me was meeting up with two of my students on the Sunday. It was the first time they had entered the show and were there using the free tickets that you get for entering. For me the best part was watching them. It's great seeing your quilt hung, it's even better when other people photograph it. There is nothing like the feeling that your quilt has inspired a total stranger. If you've not tried it give it a go. There are plenty of smaller shows to chose from. 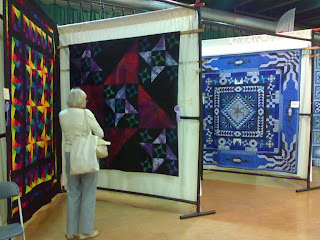 My quilts did OK in the show. My three bed quilts and Tet's were hung in a row, our own mini gallery. 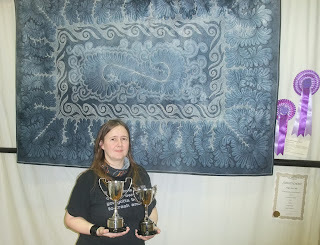 The left most two each picked up Judges Merit awards. 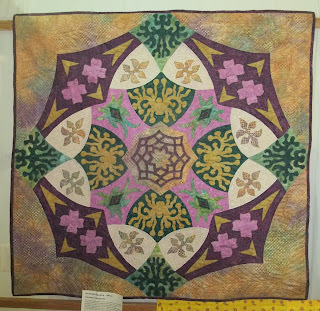 Given the quilts that won the category, I'm thrilled with that. I lost count of how many times I said that a lot has to do with who/what beats you. 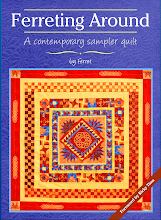 If you lose bed quilt or hand quilting to Sandy Lush you really can't take it too badly. 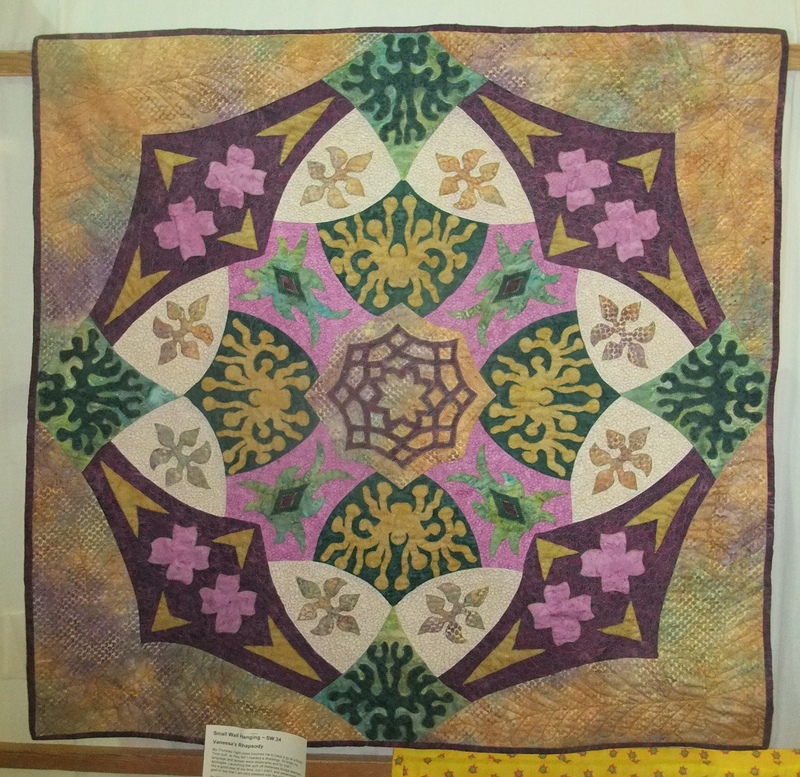 One friend I looked at the show with was very upset that a bed quilt only got third, ditto the one that came second, then she saw the winner. 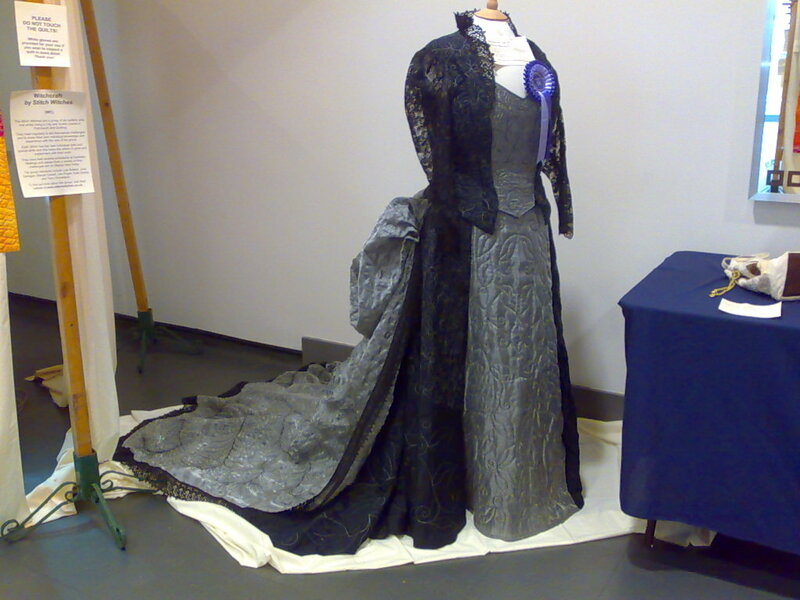 Victorian Steampunk, my dress, was a but of a nightmare to deliver and display. I thnik the show did well given they needed to stop people standing on the train. Yes it would have been lovely to have it in a position where people could walk right around it, but that really wasn't possible at that venue. The dress collected third place in wearable art. Well that's todays job done. Nine quilts delivered to the Sandown show. Not all mine I hasten to add. Two belong to students and one is Tet's. The last of mine were finished last night so they are really fresh for the show. I had been putting them off as my right arm isn't happy, but ultimately they had to be finished or withdrawn, so I sewed anyway. I did enlist help pressing the binding and hand sewing the hanging sleeves though. The photo today is from Fridays talk. As you can see it was a good size hall with a stage (thank goodness) and a great turn out. From the feedback I've had a good time was had by most if not all. 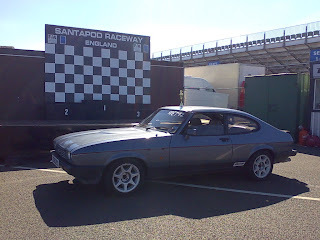 Hope to see some of you at Sandown. I will be going on Friday and Sunday. 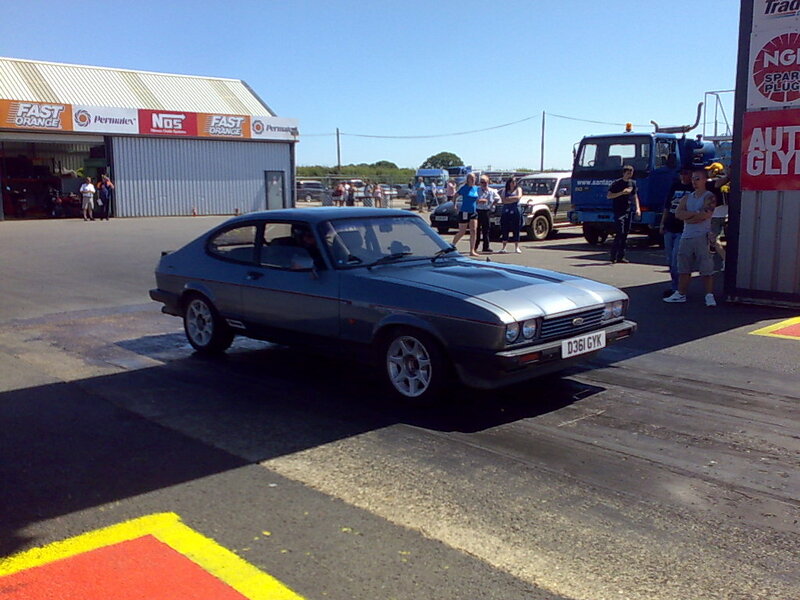 So here I am again in another car park. As a speaker and tutor you get to see a lot of car parks, maybe I should start photographing them for a collection. No, maybe not. Yesterday evening I was in Ringwood in Hampshire. It was a nice hall with a stage. Being short and making big quilts stages help a lot. It's really hard work holding all your quilts above your head for an hour but when you have a good stage you can hold them at a comfortable height. I didn't have time to take any phots though, sorry. 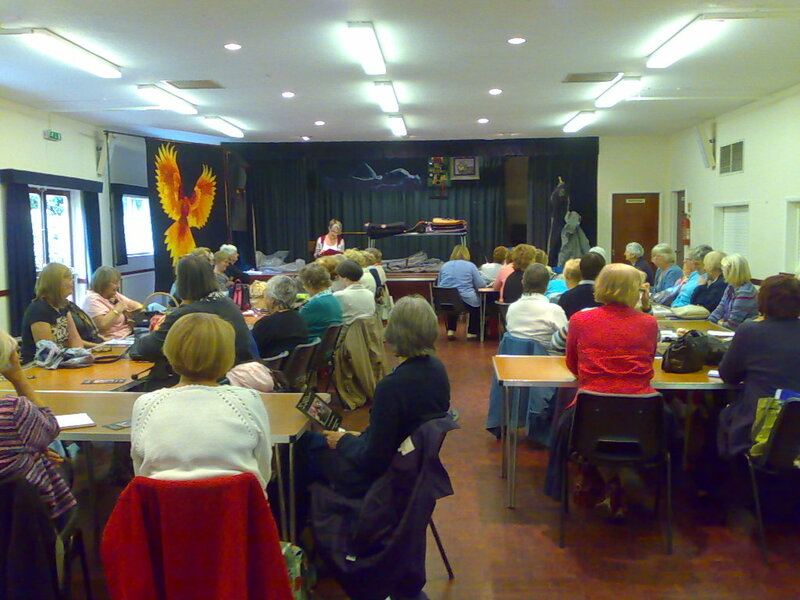 We had a good turn out and despite me being a bit rusty the talk seemed to go down well. I even got a good run home and made it back just after midnight. Today I am having lunch with Gone to Pieces near Amersham. After lunch I will try and keep them awake with my quilts. The straight after lunch slot is a tricky one. Full warm people do tend to fall asleep. I don't take it personally but I do challenge myself to try and keep them all awake. I usually fail. Sorry this blog has been somewhat neglected. It seems when I am at home I can find no end of work to fill my time. Time to bog mostly come up when I am out and about these days. Today I am sitting in a car park waiting to teach machine quilting so it's appropriate that the images I have for you are the quilting on one of the quilt's I've entered into the Sandown show. 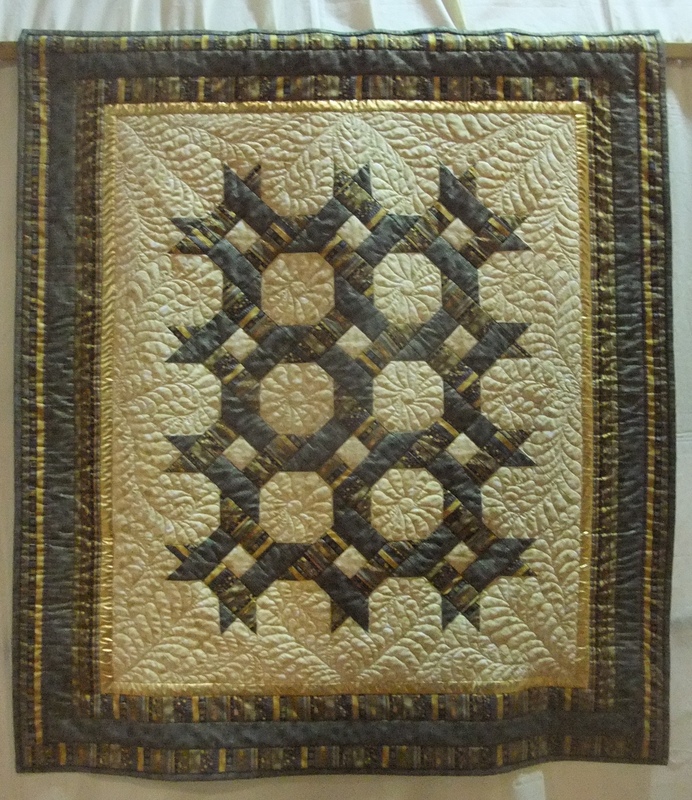 The quilt is quilted with alternating feathers and background fillers. 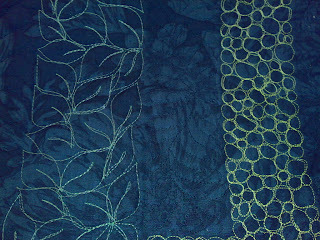 The top must have been waiting a year for me to have time to quilt it and I had fun with it when I finally got to it. 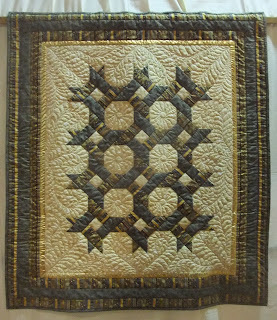 There will be a couple of new quilts from me at Sandown, so keep your eyes open for them. It's half term for my regular classes so I decided it was time for me to work on something of my own. I've been putting off my new wholecloth until I had the zippers on the frame. I know this quilt will take a lot of time so I have to be able to take it off the frame and do customer work in between. I had planned it to be a square quilt about 100" but the hand dyed cloth is too good to cut so it has ended up a slightly larger rectangle. 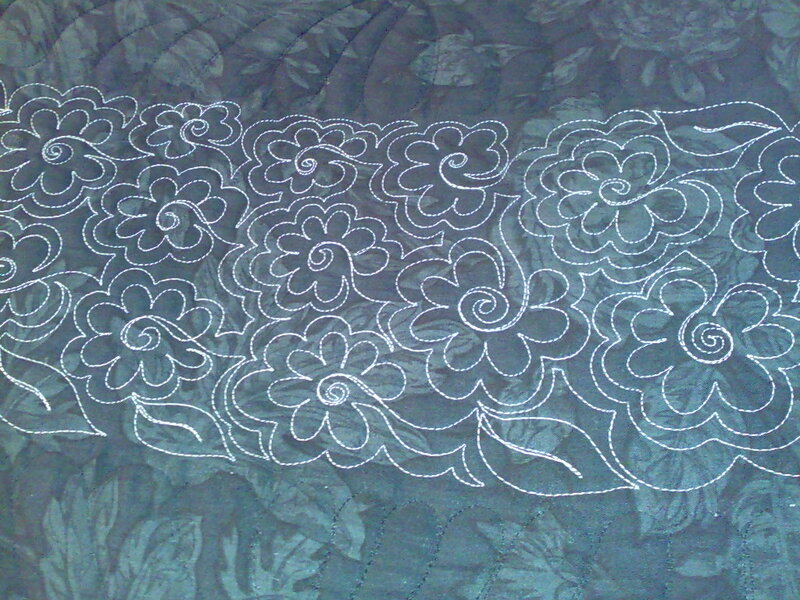 After three days solid work I am just over half way putting in only the big motifs. I love it but it won't be quick. I am hoping it might be done for the Harrogate show in September but I won't promise anything. If I miss that deadline I should have it done for the Scottish show.